The week kicks off with the next round of US tariffs on $200 billion of Chinese products on Monday (24 September). China’s retaliatory tariffs on US products take effect at the same time, possibly setting in motion the next phase of US tariffs on $267 billion of imports from China. As markets have long been pricing in the intensification of the US-China trade conflict, deliberations continue about the gravity of consequences on respective economies and the rest of the world. 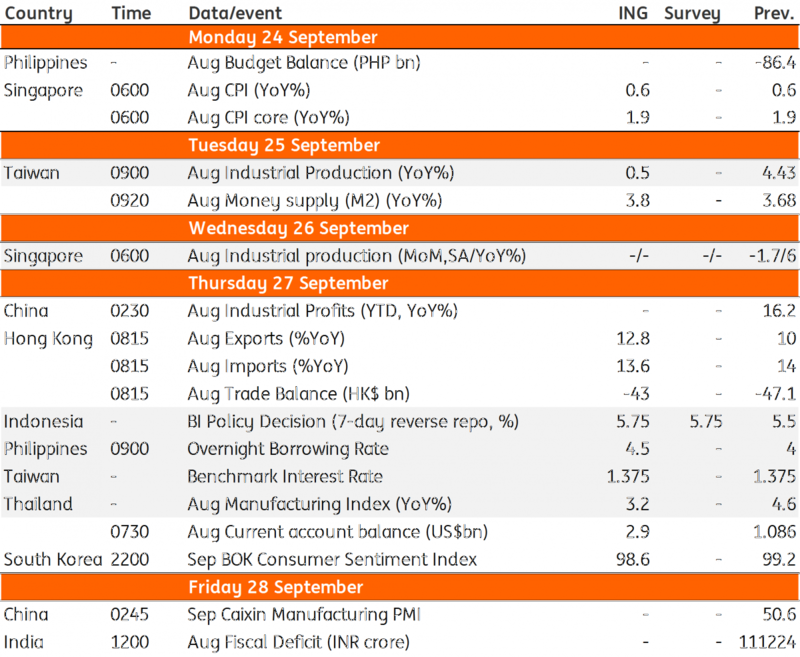 While we will hear more about this from the US Fed (the third rate hike this year to come with the Fed’s revised economic outlook), China's Purchasing Managers Index (PMI) for September may provide a glimpse of the impact on that economy. We anticipate both manufacturing and services PMIs to have ticked down from their levels in August, with new export orders and employment persisting as drags on the manufacturing side. 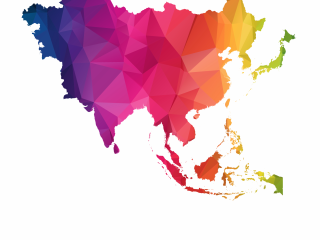 Central banks in Indonesia (BI), the Philippines (BSP), and Taiwan (CBC) will announce policy decisions on Thursday (27 September). It’s not about whether they will raise interest rates again, but by how much. Accelerated tightening by both since May this year – BI hiked the policy rate by 125 basis points, and the BSP by 100bp – haven’t been of much support for their respective currencies in the recent emerging currency rout. Some market stabilisation this week doesn’t mean that the worst is over just yet. Indonesia and the Philippines (and also India) share a weak economic backdrop characterised by rising twin-deficits (trade and fiscal) and elevated inflation, which will continue to subject their currencies to intense weakness in the event external risk rears its head again. This and already negative real interest rates in the Philippines lead us to expect the BSP to catch-up with another 50bp policy rate hike, while BI is likely to hike by 25bp next week. We expect Taiwan CBC to keep policy on hold at the forthcoming meeting. Taiwan’s export-driven economy is one of the most vulnerable in Asia to the trade war. Not only that, the US-China trade war prompting Taiwanese companies to relocate supply chains out of China will weigh on the island's growth going forward. As such, an on-hold CBC policy through the forecasting horizon up to 2020 is our baseline. August industrial production releases from Taiwan, Singapore, and Thailand will help to fine-tune GDP growth forecasts for the third quarter of the year. Underlying our forecast of moderate production growth in all three economies are slower exports in August. We think the cyclical peak of Asia’s growth is behind us. What’s in store for the future? It could be that the export-dependent region drags its feet amid greater trade protection. Or conversely, a possible reallocation of resources and diversion of trade flows to overcome tariff barriers could unleash better growth prospects. Only time will tell.